We get a LOT of seriously off-topic questions on ServerFault. This is because new users either can't comprehend the word 'server' in the site name or because they skipped the old, and very clear, FAQ. So when new users asked eight-word 'questions' about their home routers, recommendations for what was the latest, greatest motherboard or about their fishtank pump we could at least respond with a quick "please read the FAQ". This is no longer an option - we now have to respond with "please exhaustively read the entire help tree" - which I've not managed to do yet. I believe the idea behind these changes is to make the place more 'welcoming', well it will be in that new users won't have any obvious actual help and will litter the site with these inappropriate questions. Worse yet they'll go unanswered and unedited as those users with experience of the site, who put a lot of time into it, will leave or reduce their time on the site because of the lowered signal to noise ratio that's been introduced without any discussion between the site owners and those doing the actual work. I thought this site was supposed to be a community, guess we've just seen that that was never the case. We're seemingly more inundated than ever with inappropriate questions from new users - it's easy to see why. This is the top of the first page new users see - the text about 'pro system....' is WAY too small and out of the way - it needs to be FRONT AND CENTRE, in BOLD and in RED text so that it can't pass people by. I suggest it goes between the buttons at the top and the 'how it works' block below. Lots of white text, some of it important, some of it not - hidden away on the right and VERY easy to ignore. Again let's move the circled text over beneath the buttons, in bold and red so that they have to be doubly-stupid to have missed it. It won't get them all - we get some real idiots - but we're making it way to easy for new users to get confused. Mostly for the reasons given in this question I had no intention of coming back to SF, other than when Googling for answers. I back temporarily only to offer my support to the sentiment. When I started on SF the site was much more community driven. Things have been steadily going downhill ever since. Back when we could slap people over the head with "read the FAQ" things were better simply because people then realised there are rules and guidelines. Without that SF is doomed. It's already going down pretty severely (just have a look at recent content) and without some pretty drastic changes, which absolutely must give power back to the community, I see no way of reversing things. 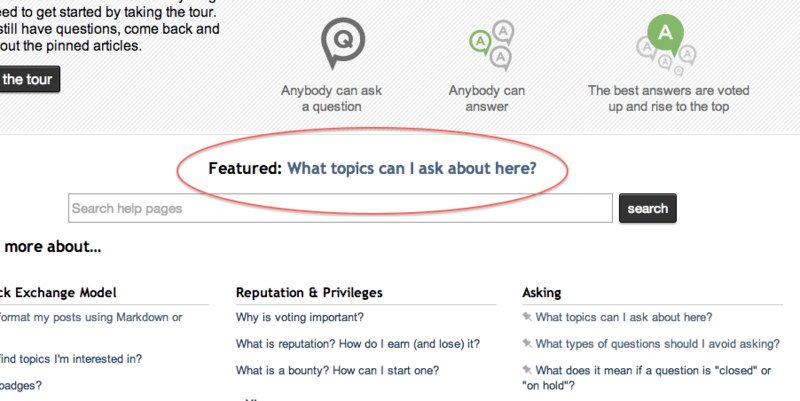 If you go to at any half decent Q&A or discussion site the very first thing you see is a prompt to read the rules/FAQ. The reasons for it should be self evident and. As for the occasional, and always undesired, appearance by "Community Managers", I can only see this as further interference by those who don't know what the hell they're talking about in a subject area they know nothing about. Keep out of SF and go annoy somebody else. The final straw for my involvement in SF was merely an extension of what is being discussed. Specifically, a moderator unilaterally, and without even a hint of an explanation, overturning a close resulting from 5 non-mods voting for said close. Who that mod is or what the question is are totally irrelevant. What is relevant is that it's dictatorship, not community involvement, the exact opposite of what the site needs. StackExchange as a whole seems to have chucked the FAQ concept, which has been with technical-internet spaces since the middle Usenet period, as a poor solution to a bad problem. FAQs mostly serve as a club to whack LazyNet denizens for being lazy. No matter how often you repost it with ***READ ME BEFORE POSTING!! *** it won't be read by LazyNetters (and will annoy regulars). The Web 1.0 variant of this, the Sticky Post, is ignored just as readily. The Web 2.0 variant, the intermodal that pops up when you click the Ask! button, just gets clicked past like every other clippy intermodal ever. To overextend a metaphor, you can lead a horse to water, but you can't make them drink, and you sure as heck won't make them drink by dumping a bucket of water over their head. Required-reading FAQs can most definitely be created. A series of web-slides going over various aspects of the FAQ, followed by a brief quiz to test for retention, for example. However, it increases the barrier to entry, and StackExchange is all about low barriers to entry. FAQs are broken and don't serve their originally intended purpose, so best to integrate them into a much larger 'how does this community work' document. Instead of a carefully honed topicality club to whack LazyNetters with, we're left with an encyclopedia-sized club to whack 'em with instead. One of my biggest quibbles with the new system, is that the http://$mainsite/faq shortcut goes to http://$mainsite/help/ not http://$mainsite/help/on-topic like it should. We have 3 years of 'As you can see in the FAQ' comments pointing to the wrong spot now. Keep the bolded text at the top. There is a reason 'not a professional' is one of our site-specific Close Reasons now. A link added below the bolded text linking to /help/on-topic, reading something like 'It is a good idea to review what else is on topic here'. The not-logged in header is actually pretty good. 'Professional' is thrown under the nose of anyone who comes here, and the Tell Me More link points to our about page, which also underlines Professional. Given the technical nature of our users, a LazyNet friendly link should be added below the button named 'Or you can just skip to what's topical here' that links to /help/on-topic. Yes, it pollutes the UI, but it's the kind of coddling behavior that'll actually funnel more people to the document we wish they'd all read. I find it's pretty easy to put a link in a comment to the on-topic help page and possibly a related meta post (or canonical question, such as for the licensing questions). A great deal of these off topic questions are covered by the bold text near the top of that page. If someone can't even be bothered to read that far (or click on the help link in the first place), I'm not sure another help page (even one that is more concise) will help them. That said, people are known to skip FAQ pages with alarming regularity no matter how easy you make it, so a proactive solution is hard. If, after being shown in bold text that our target is IT professionals looking for help with their professional environment, people still ask us how to reset their password configure their ISP-provided residential gateway or whatever, I submit there is nothing we can do except comment to them and delete their question. However, we do need to present the core of the criteria as concisely as possible. Server Fault is a site for system and network administrators needing expert answers related to managing computer systems in a professional capacity. We most appreciate questions that have a single right answer and indicate that you've done at least some research into the problem on your own. Provided that your question is of that nature, we would be delighted to help you out. That would filter out a great deal of the problematic questions while being extremely concise (but hopefully not terse). Server Fault is a site for system and network administrators needing expert answers related to managing computer systems in a professional capacity. Provided that your question is of that nature, we would be delighted to help you out. Server and Workstation operating systems, hardware, and software. 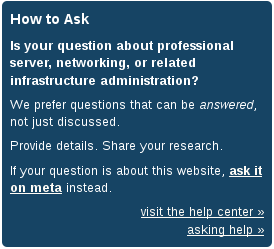 If you are unsure whether your question is on topic, please take a moment to read through our help page https://serverfault.com/help/on-topic. Otherwise, you're in the right place - ask away! This might be better than the original solution (before the overhaul) of pointing new users at the FAQ page, because at least everyone will have seen it. We could also write a proscriptive blurb, but I'd prefer to avoid that lest we appear hostile. Needless to say, I think the on-topic help page is really the key to mitigating this issue. We need to gently make it very clear that this isn't merely an advanced mode of SU. I'm the Product Manager for the Q&A sites, so ultimately all this stuff is my responsibility. The first thing I want to say is that I care very much what the community thinks about any new features or changes that we roll out to the network. I spend a good chunk of time every day sifting through meta so that I can make sure I understand where the pain points are. Just because you don't see me answering doesn't mean that I'm not there. That said, with respect to the current discussion, I've read every answer and every comment. I can't say that I agree with everything, but I'm committed to taking constructive criticism and fixing things when we've made mistakes. I sat down with Laura and Anna this morning, and we all agree that based on some of the points made here that the current help landing page design is not the best we can do. We clearly missed the browse use case that the old FAQ addressed. But I'm not going to make any further changes until I completely understand the problem. Therefore, it would be very helpful to hear from you guys about what specifically the new /about page fails at that the old FAQ page did successfully (the /about page was designed as a replacement for the FAQ, the primary purpose of the help center was just to move items out of long discussion threads on meta into a more readable and searchable format). After I've got that figured out, I'll sit down and see if I can come up with a layout that might work better. Want to make it clear that I don't intend any insult by opening a thread on MSO. For those of you unfamiliar with the history of stack overflow, the stack exchange network used to be just one site. When more sites were added, there was never a canonical Meta created - so MSO became that. It's in the works to fix, but other things have taken priority. The about page puts the on and off topic information a bit too low on the page. We will move the asking box on the help homepage to the first position. The asking box contains the on and off topic articles and also the article about closing, which we think are the three most important articles. This change isn't as big as it could've been, but we did go back to the drawing board to see if we could get a better layout fairly easily, and everything that we came up with that we liked would require a pretty decent re-architecture of the section. I'm afraid we have to move on to other things at the moment. I'm Grace Note, a Community Manager. I’d like to share the approach we took in designing the new help center, as well as some of my own thoughts on fixes that can be applied that might address your concerns. I sent a newsletter last month to all moderators shortly after the changes to the Help Center. This doesn't automatically make its way to every site's Meta, though, and especially for something as big a change as this, it is fairly important that all of the network is aware of it. We'll be looking into good ways to handle this better going forward. It is not our intention to have worsened the problems on Server Fault so let us work together to fix them. In a sense, what is present is that the old FAQ was divided into a few different destinations based on what reasons people were sent to it for. For people brand new to the site or who are unaccustomed to how the whole site works (basically, the FAQ as a whole package), the intended destination is /about. Topicality, though, is buried on this page beneath site purpose and functionality. For topicality, reputation, promotion, and all the other jazz, the intent is to link to the specific section of /help. The intent was primarily that, rather than bogging down people with this giant document. Laura explains such in a comment here, which mostly echoes what I just wrote here. This wasn't a smooth transition, though - on paper it sounds quite nice. In practice we did break one particularly convenient portion of the user guidance workflow. Falcon is right that it was designed so that linking to /help/on-topic would bring people directly to what was formerly the top of the FAQ. /faq#questions, which used to link directly to the section you're seeking out, does actually point to /help/on-topic, but considering people easily accomplished in the past without an anchor since it was the top segment, it's clear that this holdover didn't actually tide as much as it meant to. Thus we lack any directly convenient link for users to point at the actual destination intended as we used to with the FAQ, and the convenient links we do have plop people in a giant wall. Some initial thoughts on how this could be fixed. sysadmin1138's post made me notice that we actually don't have quite the same hero bar on /help as we do for anonymous user homepages. At the very least, appending the "Server Fault is a question and answer site for professional [...]" on that bar there, before we tell them about taking the tour, might be nice. It won't address the underlying problem but considering the hero bar there is directed at a new user (hence the tour option), I think restating the site audience is appropriate. Past that, the main thing is to make the appropriate links more convenient to use in some fashion. Especially topicality, as Server Fault isn't the only site that primarily just pointed at /faq to hit the top of the page - I've got a fair share on Arqade that is probably all kinds of wonk now. The original actions aren't "lost", since /help/on-topic covers exactly the section that we all want to point at with convenience, conciseness, and straight-to-the-pointness. It lacks the ease-of-access that the old FAQ had though, and while people can link to it directly, there is no direct route for new users to see nor a quick link for experienced users to provide guidance with. Don't want to make a big rush on this portion here though, so we're still looking at how to work on this part. Something kinda like what is asked for here. As a way to help mitigate the fact that yes, the new help center is much longer than the old FAQ, we've added a nice big featured link to the on- and off-topic page, front and center in the help center. This way, it's MUCH easier to find when people stumble across the help center on their own, or get there from an old faq link that redirects them to the help center landing page. Going forward, the goal is that users will link to specific help articles to guide users to a place that addresses their specific issue (whether it's the list of topics accepted here, rules for appropriate behavior, explaining why questions are closed, etc.). We've learned that people do not sit down and read any sort of FAQ or help center end to end, even if all of the information is on one page. Contextual learning is usually more likely to convey information that sticks, which is why we designed the help center this way.